It is high time we recognized our local and global economies as living systems, just as we do our families and our individual bodies. We can see more clearly what is going on in our world if we understand the individual, the community, the nation and global human society as living systems embedded within each other, just as our cells are embedded within our tissues, organs, organ systems and bodies. Arthur Koestler had an elegant terminology for this concept: holons in holarchies (Janus: A Summing Up, Pan Books, London 1978). A holon is a single living system or entity embedded in a larger holon, and so on. Holons of these different embedded sizes thus formHolarchies—a distinction from hierarchy intended by Koestler). Many critics of market-driven capitalism, including some among those who have gained the greatest wealth from it, such as James Goldsmith and George Soros, are aware that, since the fall of communism, market capitalism has become the greatest danger to human well being. The measure of human success must shift from money to well being for all humans and all species. To do this, individual and communal human values must be reclaimed and acted upon in a way that ensures a balance of local and global interests. And the World Trade Organization will have to recognize that strengthening local economies to the point where they can effectively express their self-interest is critical to its own success. Historian Arnold Toynbee studied twenty-one past civilizations, looking for common factors in their demise. The two most important ones, it seems, were the extreme concentration of wealth and inflexibility in the face of changing conditions within and around them. We cannot go on playing Monopoly when a cooperative game is called for by our new and obvious problems, both local and global. The relentless pressure of the single bottom line of profits in our corporate world is probably the greatest factor in our non-sustainability as a species. While the creative competition this bottom line drove brought much benefit to our world, its damages now outweigh those benefits and this economic system must be radically redesigned. We all know that even aside from ecological damage, the exponential growth of profits and of wealth concentration is not sustainable. Yet, any effort to make corporate accountability to planet and people of equal importance with profits, no matter how critical we know that effort to be, bumps straight into the problem of capitalist competition. What will it take for our collective international will to recognize that no amount of profit can be worth the extinction of our civilization and our species? The fundamental cycle repeating itself over and over in the course of biological evolution proceeds as shown below. 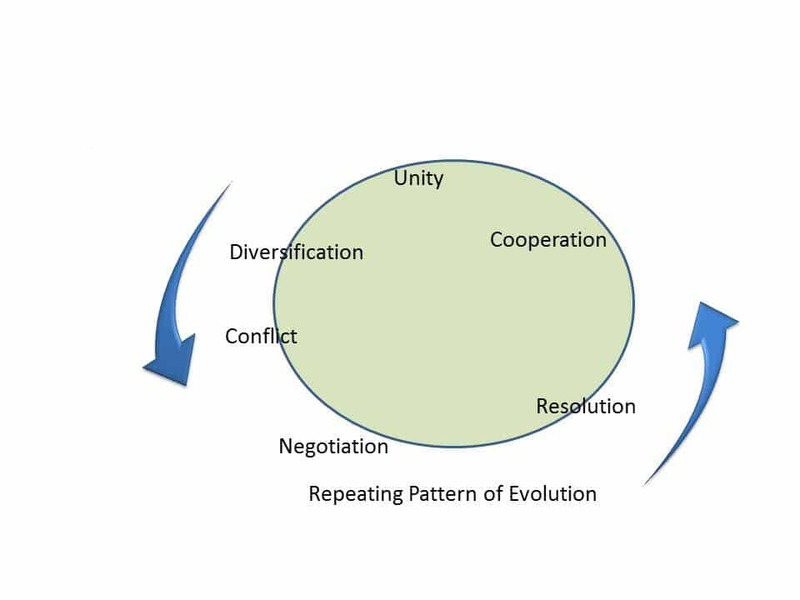 Actually, it is not a closed loop, but an open one, such that it returns to unity at a higher level. For example, ancient bacteria diversified from the Earth’s crustal materials, originally a homogenous mass. Myriad conflicts developed among them in a long competitive phase, spurring them to amazing diversity of lifestyle and technological inventiveness. Those that did not kill each other negotiated and eventually resolved their conflicts in a cooperative new scheme: the only cell other than bacterial ever to evolve on Earth—the nucleated cell, which was originally a cooperative colony of archaebacteria. Ergo, unity at a new level. Ecosystems also diversify and go through phases of competition among their species until they mature into a cooperative mode, as in a well-evolved rainforest or prairie that functions like a living entity or body as a whole. In fact, in a mature ecosystem the best life insurance for any species lies in what it contributes to the others, to its competitors for space and resources. Keeping them alive assures its own existence! As species matured, they ceased behaving the way their aggressive, competitive ancestors behaved and evolved a new cooperative way of life. To follow suit in our human economies, we cannot rely on individuals (CEOs, owners of businesses) to make such changes within a field of ruthless competition; rather, we must implement an open dialogue in our local communities as well as globally on how to do it together. Nothing must stand in the way of unleashing human creativity now to design a truly sustainable economics. The evolutionary dance is energized by the self-interest of every part and level of Holarchy; it is choreographed by compromises made in the tacit knowledge that no level may be sacrificed without killing the whole. At its best it becomes elegant, harmonious, beautiful in its dynamics of non-antagonistic counterpoint and resolution, as in a healthy body wherein cells, organs, organ systems and the body as a whole are in endless dynamic negotiations concerning each level’s well-being. As we learn Nature’s ways and follow suit by redesigning and reorganizing our economies as self-organizing Living Systems, we will learn to balance earning a living (profits) with the other needs of living systems. That means, among other things, that our businesses will engage in dialogue with, and become accountable to, the communities and ecosystems in which they are embedded holarchically. A living dialogue among all levels of Holarchy is the only way to repair damage done by the currently dangerous imbalances resulting from the single bottom line. To guide us in assessing the health of current economies as living systems, which will show us the ways in which they are not healthy and give us clues toward what must be done to restore their health, we might begin by using the following Main Features and Principles of Living Systems derived from the study of biological systems as a checklist. Evolution proceeds primarily in response to crisis situations, when genomes get inventive, drawing on their great libraries of information to develop new gene configurations. My hope for humanity lies in the fact that life is resilient and that the greatest catastrophes in our planet’s life history have spawned the greatest creativity.